Hair loss happens for most men, especially as they get older. While for some men this means their hair isn’t as thick as it used to be, for others is means major hair loss or complete baldness. This can greatly affect a man’s confidence and self esteem. Although many men struggle with hair loss, this doesn’t have to be the case. There are many factors that can contribute to hair thinning or hair loss. Stress for example can have a major effect on hair loss. Cortisol, the hormone produced when the body is under stress, can disrupt the hair growth cycle. This can cause hair growth to shorten or stop completely. Other factors like medications, medical conditions, and/or diet can influence hair loss. However, genetics is the most common cause of hair loss in men. 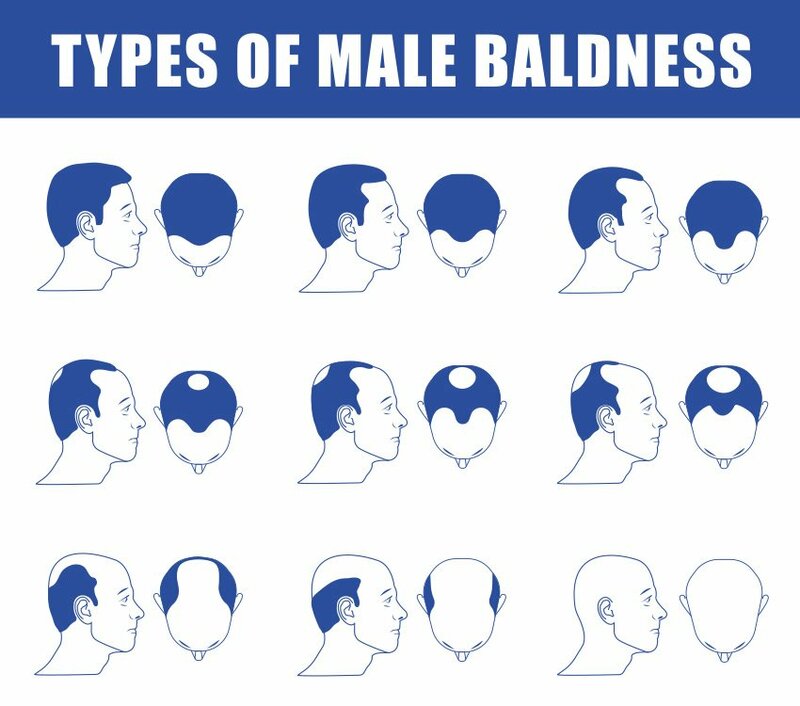 Male pattern baldness, a form of androgenetic alopecia, is hereditary and accounts for more than 95% of hair loss in men. While age is an important factor as well, around 25% men who inherit the male pattern baldness gene will begin to see thinning hair before the age of 21. By about 50 years old approximately 85% of men will have some obvious form of thinning hair or hair loss. There are many types of male hair loss thus there are many types of hair loss solutions. In the case of thinning hair, medication can help slow down the process. Medications like finasteride and minoxidil are often recommended and can help reduce hair loss in 85% of people. However, when someone is dealing with bald spots or a hairline that has already receded, medication often falls short of the task to restore hair. Numerous hair restoration and hair replacement options have been on the market for ages. The strip method technique or follicular unit transplantation (FUT) has been used for years, however recovery can be painful and slow. This technique also comes with a higher risk of infection, as well as visible scars from the transplantation incision. As the technology and understanding of the hair growth cycle has improved, so have hair restoration techniques. There now exist a way to get your hair back –SmartGraft, a FUE technique, has become a leading option for men when it comes to growing new hair and eliminating bald spots. SmartGraft provides patients with a safe, minimally invasive hair restoration procedure but most importantly it results in real, thriving new hair. For men struggling with baldness this is a crucial aspect of the procedure since it’s fundamental that the new hair growing back blends in and provides an undetectable, natural look. Men can permanently achieve these astonishing results with SmartGraft. Consult an expert hair restoration physician about SmartGraft today and learn how you can get your hair back.